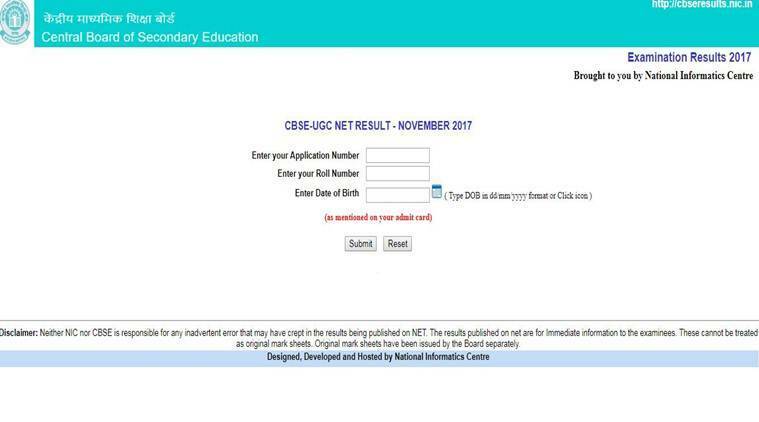 UGC NET 2017: Central Board of Secondary Education (CBSE) has released the results of National Eligibility Test (NET) 2017 on January 2. The candidates can check their results at cbsenet.nic.in. About 9.30 lakh candidates registered for the exam conducted in 91 cities at 1700 exam centres. A total of 4,09,439 male 5,19,557 female candidates and 3 transgenders registered for the UGC NET exam held in November. More than 75 per cent candidates appeared in the exam. The candidates appeared in three papers, paper-I of General Awareness was common for all and paper-II and III were conducted out of 84 subjects selected by the candidates. CBSE has also released the OMR sheet and answer keys last month. Step 1: Go to the official website of the UGC NET exam (cbsenet.nic.in). Step 2: Click on the notification for the results, which will be available on the home page. Step 3: Enter your roll number and other details in the fields provided to search for your results. Step 5: Download your results and take a print out of the same for further reference. The candidates who qualify for the UGC NET, they are eligible to pursue research in the subject of their post-graduation or in a related subject and are also eligible for assistant professor posts.